Stand the corn on end inside a large bowl and cut the kernels from 2 ears of the corn, using a paring knife. Grate the remaining 2 ears corn over the large holes of a box grater into the same bowl. Using the back of a butter knife, scrape any remaining milk from the cobs into the bowl. Stir the egg, flour, cornmeal, sour cream, Cholula Chipotle, scallion, salt and baking powder into the corn to make a thick batter. Heat 1/4 cup of oil in a 12” skillet over medium-high heat until shimmering. Drop heaping tablespoons of batter into the oil (6 fritters should fit into the pan at once). Fry until golden brown, about 1 minute per side. 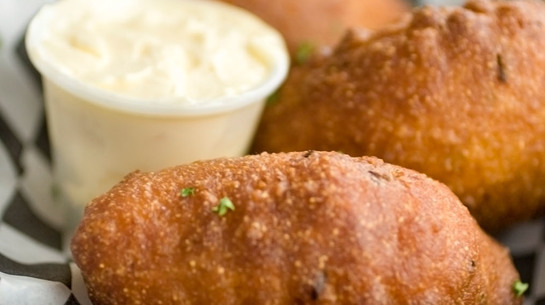 Transfer the fritters to a paper-towel-lined plate and repeat with remaining batter. Serve with Cholula Garlic Dip.